Billie Eilish, if you somehow have not yet caught wind of her meteoric rise, is a different type of teen pop star. Her persona, one that scoffs at the sweet and bubbly tropes associated with young pop stars, has helped attract a massive amount of interest so early in her career. The 17-year-old songstress instead leans into sparse electronic beats and creeping vocals. She fully embraces a horror film aesthetic, one that aligns her more with the Misfits than Ariana Grande in attitude and image. Her strengths are easily seen on the opening single “bad guy.” Rubbery bass and woozy synths give way to her alluring, quiet voice. Eilish is fully capable of writing memorable hooks. She also taps into her anxieties and sells it in a visceral package. 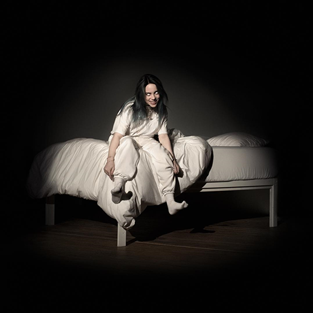 The music on When We All Fall Asleep, is the most interesting when she can do both simultaneously. “you should see me in a crown” contrasts brooding and subdued verses with a fierce drop and venomous chorus. Her successful format also comes through with the lead single “bury a friend.” Layered and distorted vocals swim through an impressively textured electronic beat. It is one of the more inspired lyrical moments on the record as she writes from the perspective of the monster under her bed, most likely a symbol for the sleep paralysis she openly speaks about and hints at on the album cover art. There are weaker lyrical moments, however. On tracks like “all the good girls go to hell,” Billie is trying really hard to show her jadedness, but it just comes off as forced and clumsy. Take also for example the sentimental ballad, “i love you.” For a record posing itself as the alternative to pop’s predictabilities, the lyrics here would be expected on just about any mass marketed top-40 release. Like the aforementioned “i love you”, some songs tracks pale in comparison to others in their instrumentation and arrangement. The piano ballad “when the party’s over” is pleasant for a moment, but doesn’t give much reward to repeated listens. Eilish’s voice is not enough to overcome the bland acoustic fingerpicking and EDM-lite chorus. The springy “8” sticks out for all the wrong reason on this album. It’s altogether too cutesy with its campfire strumming while some rather awful vocal processing also bogs down the track. It is strange decisions like these that will have to be corrected if Eilish is ever going to have a truly great album under her belt. WHEN WE ALL FALL ASLEEP, WHERE DO WE GO? has its high moments, but it sounds like Billie is still holding back. There are confusing moments where Billie seems to so desperately want to be perceived as edgy, but finds herself leaning into campy pop kitsch. At times Eilish’s whispery vocals become redundant - bland and boring even. The eccentric beat patterns, when present, are when the album is at its best; her voice has not gained the flair and presence yet to be the focal point of a tune. Still, Billie Eilish shows enough flashes of potential to hold optimism towards future releases.